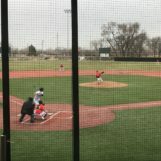 GARDEN CITY, Kan. — The Garden City High School Buffaloes baseball team made quick work of Finney County rival Holcomb on Thursday afternoon at Clint Lightner Field, winning 16-1 and 15-0. Both games ended in three innings via the run-rule. The Buffaloes were able to jump on the Longhorns early in both games, but it wasn’t the Garden City hitting that was causing Holcomb problems. The Longhorn pitching staff struggled mightily in the two games, walking 14 Buffs between the two games and hitting seven. Garden City struck for eight runs in the bottom of the first inning in game one after they gave up one run in the top half. The first seven batters for the Buffs in the inning came around to score, as they sent 13 to the plate. Jayden Escamilla led the offensive charge in the first game, going 2-for-3 at the plate, including a 3-RBI day and a lead-off double in the first. Auston Waetzig also drove in three runs in the game one victory, going 1-for-3 at the plate. Aaron Urrutia was credited with the win on the mound for Garden City. Although Urrutia struggled in the first inning, he was able to settle in the final two innings and used the offensive production to his advantage. Urrutia was able to get out of a bases loaded jam in the first inning only allowing one Holcomb run. The Buffaloes sent Ethan Newberry to the mound in game two and he was dominant. Newberry finished with six strikeouts in the contest and allowed two hits. Garden City struck for two runs in the first and four in the second to go up 6-0 after two innings. Newberry sent the Longhorns down in the top of the third and that’s when the Buffs’ offensive rally began. Escamilla walked to begin the inning and then stole second and third. That would just be the beginning to a nine-run inning for GC. Waetzig scored ACker on an RBI triple, as Waetzig finished game two 3-for-3 with a single, double and triple, all in order. Kaden Luna ended the game with a ground ball to third, but an error allowed Escamilla to score the winning run to make it 15-0. Garden City is now 4-0 on the season and will host Dodge City on Tuesday at Clint Lightner Field. First pitch is scheduled for 5:30 p.m. You can hear the action on ESPN 99.9 FM.